We are searching for a green, chamois monkey from the Pottery Barn line “Critters,” made in China (by Gund, I think) and sold at Pottery Barn Kids stores and outlets circa 2004. There are a couple of other critters from the same line, including a blue hippo. This Green Monkey also shows up as a baby rattle, but I am looking for the Monkey itself. Mine seems to have gone on a long jungle adventure and my 3 year old is hoping he comes home soon! 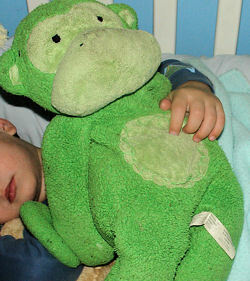 If you can help WC find this Pottery Barn Green Monkey, THIS SITE IS NO LONGER ACTIVELY MANAGED. Please use Our FREE FACEBOOK GROUP, including #040608-10 in the subject, . I have this monkey! He is green and about 18″ inches tall. He is in very good condition. Let me know if you are still looking as I was about to list him on ebay. WC has contacted me and says she has already found a replacement for this monkey; so she is no longer searching.